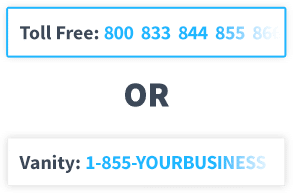 Select a toll free 800 number in any toll free area code including 800, 888, 877, 866, 855, 844, 833, or choose the perfect vanity 800 number for your business. Forward your 1-800 phone number straight to your cell phone or use our automated attendant to greet and route calls to any number of phones, extensions, or voicemail. With a 1-800 number from UniTel Voice, you can receive calls, faxes, and voicemail anywhere, anytime, on any phone (cell, home, or office phones). Because 1-800 business numbers are so widely used by established companies, there’s an undisputed sense of trustworthiness associated with using them. For startups especially, using a toll free number as your business telephone number can make your company look bigger and more established. Using an 800 number also gives your business a nationwide presence. Make it easy for your customers to get ahold of you with your own 1-800 telephone number from UniTel Voice. 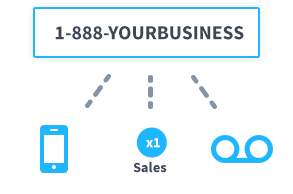 If you move, open another location, or change phone companies, you can keep your toll free 800 number and take it with you as your business grows. With UniTel Voice you own your toll free number and can port it to another toll free service provider at any time. Strengthen your brand with a vanity 800 number that spells a word related to your business’s name or your value proposition (e.g., 1-800-FLOWERS, 1-800-XFINITY, or 1-800-BUYCARS). A custom 800 number not only boosts your brand recognition, it’s also easy-to-remember, making it highly effective in offline advertising (e.g., on the radio, billboards, TV, even painted on your truck). 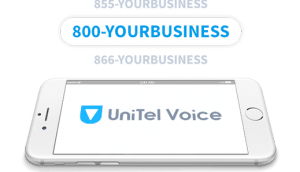 When you buy a 1-800 phone number from UniTel Voice you’re not just purchasing affordable toll free number service, you’re getting the complete UniTel Voice virtual phone system designed to let small business owners and startups run their business from anywhere. With a UniTel Voice’s 1-800 number service, you can run your business using cell phones and look, sound, and function like a Fortune 500 company. 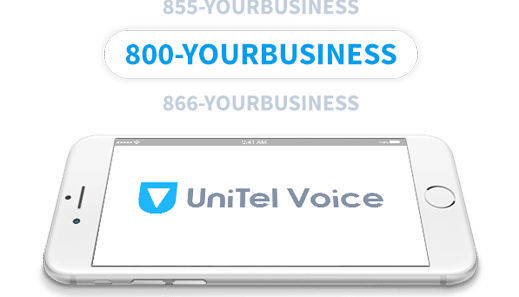 Why Get an 800 Number from UniTel Voice? Priced to grow with your business, UniTel Voice is one of the smartest and cheapest 800 number services available. We're affordable on any budget. 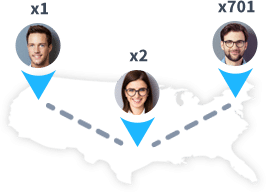 All 1-800 number plans include the same amazing features and 100% USA-based support to ensure you're up and running fast and easy. Cheap 800 service doesn't mean low call quality. UniTel Voice uses an industry-leading network with world-class reliability to keep you connected. While some toll free service providers rent or lease vanity 800 numbers, with UniTel Voice you own your toll free 800 number with no strings attached. 1. Are 1-800 phone numbers still available? UniTel Voice offers businesses three types of toll free numbers: One, “recommend toll free phone numbers” which include the following toll free prefixes: 888, 877, 866, 855, 844, 833 and soon to be released 822. Two, “true 1-800 numbers”, which are toll free numbers with the prefix 800. And three, “vanity toll free numbers” which are toll free phone numbers that spell a particular word or phrase related to your brand or value proposition (e.g., 1-800-FLOWERS or 1-888-FIXROOF). 2. 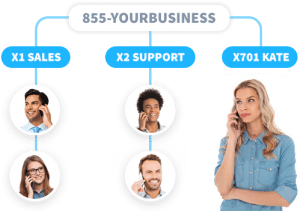 How does 800 number forwarding work? Once you’ve selected your 1-800 business number you can set it up to forward directly to your existing phones or to an auto-receptionist that greets your callers and forwards them to any group of phones, extensions, or voicemail boxes you wish. Time-of-day routing and find-me-follow-me features are also available so you never miss a call from your toll free 800 number. 3. Can my 1-800 telephone number receive faxes? Yes, you can receive calls, faxes, and voicemail on your number anywhere, anytime. When your number receives a fax or voicemail, it’s automatically sent straight to your email’s inbox, your UniTel Voice smartphone app and your UniTel Voice account’s online management portal. 4. Can get a 1-800 number with its own voicemail box? Yes, all toll free 800 numbers include virtual voicemail, however, you can choose to use the existing voicemail on any device you forward your 1800 number to. Your phone number can also be set to do not disturb mode and forward directly to an unavailable greeting if you wish. 5. How do I access voicemail messages that come in on my 800 number? When your phone number receives a voicemail, it’s automatically sent straight to your email inbox, your UniTel Voice smartphone app and your UniTel Voice account’s online management portal, so your voicemail is accessible anywhere you go. 6. Can I forward my 1-800 phone number directly to my cell phone? Yes, you can forward your number directly to your cell phone’s number or to your UniTel Voice smartphone app. You can also forward your toll free 1800 number straight to voicemail. 7. Can I forward my 800 number to multiple phones? Yes, you can forward your number to any group of phones, in any order, and to any type of phone (cell, landline, VoIP) for that matter. You can also set it up to round-robin or simultaneously ring each phone or extension. 8. What types of phones can my 1-800 toll free number forward to? 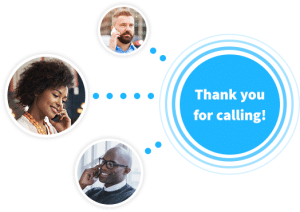 You can forward your 1-800 phone number to unlimited greetings, extensions, voicemails or phones (including your existing cell phones, flip-phones, smartphones, softphones, home phones, office phones, VoIP phones, or even old-school landline phones). 9. Can I send and receive text messages with my 800 number? Yes, UniTel Voice offers 800 number texting that allows you to send and receive SMS text messages using your business number. 10. How do I get a custom 800 number for my business? You can get one right here. UniTel Voice is an authorized RespOrg (Responsible Organization designated by the FCC) with direct API access to all available vanity 800 numbers via the National Toll Free Number Database. This gives our customers the ability to search for all available 800 numbers (by word, phrase or numeric combination) in real-time. 11. Why are good vanity 800 numbers so hard to find? True 1-800 phone numbers were first released in the 1960s, so almost all of them are in use with current companies. And if you are lucky enough to get your hands on one, it’s likely that the toll free 800 number has been recycled, meaning a previous company or two had at one time used that 800 number as their business number. UniTel Voice has access to a large supply of true 1-800 telephone numbers, but they are going fast. 12. If an 800 number is disconnected, does that mean it’s available for purchase? Unfortunately no, just because a toll free number rings disconnected doesn’t mean the number is not technically “in use” by another company – it likely means that the number is just not set up to call forward or the telephone number the 800 number originally forwarded to has been disconnected. Contact our customer service team for assistance and we’d be happy to help. 13. How can a 1-800 phone number boost my marketing efforts? For new business, using a 1-800 phone number makes you look more established. Simply having an 800 number on your website gives potential customers a sense of trust and reassures them that they can reach your customer service team if there is an issue. But outside of trustworthiness, an easy-to-remember vanity 1-800 phone number (e.g., 1-800-XFINITY or 1-800-DENTIST) can reinforce your brand and make it easier for your existing and potential customers to reach you. 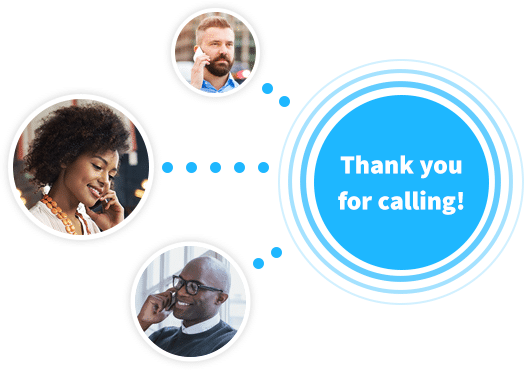 Furthermore, modern toll free number service like the kind you can get from UniTel Voice (for as little as $10/month) allows you to track calls, route calls to multiple phone numbers, and use a virtual receptionist to take customer messages. With UniTel Voice, you can even use multiple toll free numbers (one for each marketing channel) to track calls coming in. This will give you a good sense of each marketing channel’s ROI (return on investment). If the phone number for your online ads is getting more calls than the number you advertise on the radio—then you know where to better spend your marketing dollars. 14. What should I do if I can’t find a good vanity 1-800 number? Unfortunately, true 1-800 numbers are almost all in use by other companies nowadays. Although UniTel Voice has access to some great 1-800 phone numbers, if you’re looking for a toll free number that spells out your brand name or value proposition you might have to go with a newer toll free prefix such as 888, 877, 866, 855, 844, or 833. If you need help coming up with ideas, contact our support team and we’d be happy to help you brainstorm. Note: when you use our signup form, you can search the national toll free number database in real-time giving instant access to every available toll free phone number in North America. 15. Is it okay to rent an 800 number? There are some toll free service providers out there that rent numbers to businesses. The way it works with some service providers is they have an inventory of some really good 1-800-phone numbers (e.g., 1-800-DOCTOR, 1-800-FIXROOF, 1-800-PLUMBER, etc.). They then rent their numbers to local businesses at high rates. The same phone number can be rented to multiple businesses in different locations using something called geographical call routing. For example, if you call 1-800-Plumber in Chicago you would be routed to “Joe the Plumber”, but if you called 1-800-Plumber in Oklahoma City you would reach “Wade the Plumber”. The upside for Joe and Wade is that they get to advertise a great 1-800 number. The downside is it’s expensive, and if they decide to stop renting the number because the rates increase or whatever, they would have to change all of their marketing material (i.e., business cards, advertisements, might even have to repaint their truck). With phone companies like UniTel Voice, you own your 800 number outright and can port it to another phone company at any time. It’s your number and your business asset. You own your company’s phone number like you own your company’s website. If you think renting a 1-800 phone number will increase sales, you should give it a test run before signing a long-term contract. Try it on the radio or in your local newspaper, but don’t paint the number on the side of your truck until you’re sure you’re getting a good ROI.